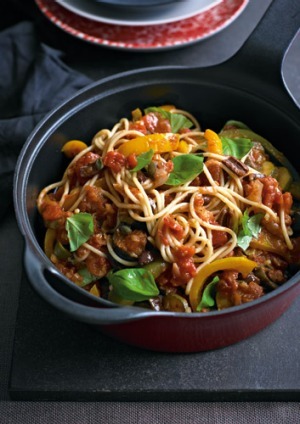 Bursting with barely cooked vegetables, this pasta is a quick and nutritious option. If you want a vegetarian version, simply omit the anchovies and add some dried chilli flakes instead if desired. Fettuccine and bucatini could also work well in this dish if you want a change from spaghetti. 1. Heat the oil in a large frying pan. Add the onion, garlic and eggplant and cook over medium heat for 5 minutes, or until the onion and eggplant are soft. Add the capsicum and zucchini and cook for a further 3 minutes. 2. Add the tinned and fresh tomatoes and simmer for 20 minutes. Add the capers, anchovies and olives and simmer for 10 minutes, or until the sauce thickens slightly. 3. Meanwhile, cook the pasta in a large saucepan of boiling salted water, following the packet instructions, until al dente. Drain well. 4. Toss the sauce through the pasta, garnish with the basil and serve with the parmesan cheese.